Shamash was the ancient Mesopotamian sun god. Known as Utu in the Sumerian tradition, he was the twin brother of Inanna and the son of the moon god, Nanna. In Akkadian culture he was called Šamaš, and was the son of Anu or Enlil and his wife was Aya (Black and Green, 182-4; Horry). In ancient Mesopotamia, Shamash formed an astronomical collation with Sin, Ishtar, and the goddess Venus that was worshipped throughout the fertile crescent (Encyclopedia Britannica). Shamash was a prominent literary and religious figure throughout Mesopotamia. Shamash was in control of bringing light and warmth to the land. This life bringing light enabled crops to flourish (Encyclopedia Britannica). Also known as the divine figure of justice, Shamash was thought to be the judge of the gods and humans. During the dark of night Shamash exercised his role as governor of the universe to the judge the underworld (Encyclopedia Britannica). The Code of Hammurabi is said to be written as a contract to Shamash (Horry). Shamash had some cult followers, and temples were built for him in Sippar and Larsa. Shamash played a key role in divination ritual sacrifices. The king would have a sheep sacrificed then examine the liver to find answers. Shamash was in charge of making sure these answers were fair and correct (Horry). Many images connected to Shamash’s key attributes have been recovered from numerous ancient sites. Shamash was said to be a protector of travelers and play a key role in the safe arrival of travelers to their destination (Mark). This image depicts Shamash on a chariot above a mountain. Shamash is commonly illustrated traveling on a boat, chariot, or horseback which correlates to sailors, soldiers, and travelers/merchants (Encyclopedia Britannica; Mark). Shamash’s location on top of a mountain is another indication of his godly status. On the top of the image, the sun disk symbol for Shamash can be seen. This disk is usually portrayed with four points with spherical shapes between each point (Horry). Shamash is often depicted with this disk in the sky that represents the sun (Encyclopedia Britannica). 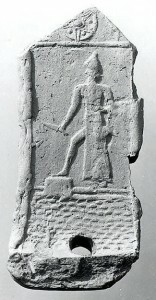 In his right hand he holds a dagger. The dagger is a representation of Shamash cutting through the mountains at sunrise to bring light to the universe (Mark). 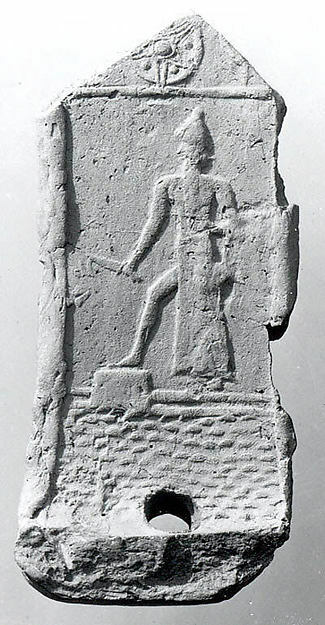 His right foot in placed on a stool, which is another indication to the viewer that this is a god, not a ruler. This object is a testament to the widespread symbols and worship of Shamash. Black, Jeremy and Anthony Green. Gods, Demons, and Symbols of Ancient Mesopotamia. London: The British Museum Press, 1992. “Shamash.” In Encyclopedia Britannica. Last modified April 8, 2014.